First up, all the people who expect to recapture the comic magic of the past, and relive the brilliant entertainment of Rajendra Prasad movies through this movie must realize that the ticket is NON-REFUNDABLE. Welcome to Andaru Dongale. In order to respect the code of movie watching, everybody kindly turn-off your beepers, cell phones and sense of human decency. During the course of the entire movie, you are encouraged to laugh at nuclear test levels like mad men. Because, frankly, only mad men would do that, anyway. Another important prerogative to keep in your muddled mind or rather keep off it is the ignorable fact that Rajendra Prasad was compulsively funny in the past. Compared to that, he looks like a clueless dud in this one. The writers were truly talented then. They're truly perverted now. It's a handicap comparison. The makers might want to break your limbs for making the comparison. Rajendra Prasad and Prabhu Deva scram from their village because Kovela Sarla wants to marry Prabhu Deva. She vows to get married to him, come what may. The makers want to point out that the phrase 'come what may' includes the buckets full of vomit, the contorted facial tick you may develop due to grossing out (ewwww) and the brain-splitting headache caused by the obscene acting of Kovela Sarla. Rajendra Prasad and Prabhu Deva reach the city, and settle with Bramhanandam and his gang of four robbers. These four are seasoned comedians, and along with them, the plot goes through many insipid situations, which any idiot would find funny. And if you're not the moviemaker, you'd find it annoying. But if you're neither, the makers are not responsible for inducing a sleep so deep that you end up in a coma. Then there's Nagoor Babu. This guy has come out of the hiding after a very long time. Not to worry, he will quickly get back into hiding after this muck, anyway. He's the rich daddy of Ankitha who's in love with Kiran Rathod. No, Ankitha is not in love with Kiran Rathod, her daddy is. Kiran Rathod is trying to marry Nagoor Babu for his wealth. Ankitha is trying to kidnap herself. 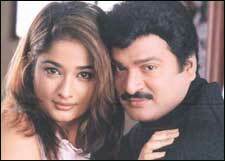 Rajendra Prasad is trying to fall in love with Kiran Rathod. Prabhu Deva is trying to replace flexible rubber with himself. Bramhanandam and others are trying to steal things. After trying so much yuck, the makers are not responsible if a viewer starts banging his head against the armrests of his seat. He will not be allowed to take that seat to his home in any case. However, he is allowed to take his head with him. After a while, Prabhu Deva accidentally kidnaps Ankitha. Then, Ali kidnaps Ankitha. Then the police kidnap Surya. Then Kovela Sarla kidnaps Prabhu Deva and Ankitha. And someone obviously kidnapped the costume designers of Kiran Rathod and Ankitha. They kidnapped their dieticians, also. The last two kidnaps we we don't mind, all that much. The makers welcome any nice comment on the movie. The comment 'Holy cow! Rajendra Prasad's tummy is truly as big as Jupiter' is not considered 'nice'. Even comments like 'this movie will get into the Guinness Records for being the first to have no story at all' and 'this movie is a good relief for indigestion and insomnia' are not considered encouraging. And the makers' lawyers have told them to give something in return to avoid people from suing them for attempted murder. The management is happy to announce that all the people who purchased the tickets can keep the counterfoils with them for free. Free! If you have any other complaint, feel free to sue the actors' asses into oblivion. Until the next time then, remember that the moviemakers always love you. Take care and so long, suckers. Be the first to comment on Andaru Dongale! Just use the simple form below. fullhyd.com has 700,000+ monthly visits. Tell Hyderabad what you feel about Andaru Dongale!